have to do at least once, if you want to make your own site. something for you another day. 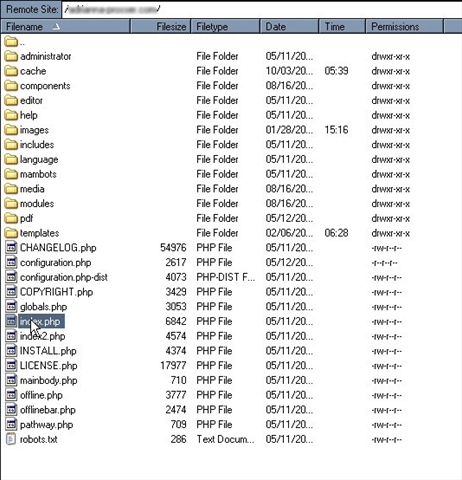 When you upload files to your web host, you will use a program called an “FTP program”. FTP stands for File Transfer Protocol. There are hundreds (if not thousands) of programs you can choose from. I’m going to suggest a free program called FileZilla. First, and overview of the Filezilla interface. If you click on the image to the right, it will open in a new window. On the left hand side of the program, is the “local site” section. them. This is what is known as the “folder tree” for your computer. drive is called C: (and you are using a Windows Computer). You’ll want to go to C:\Documents and Settings\your name. section (both sections are pictured above). right hand side. What could be easier than that? These are the two most important sections. You don’t really need to know much else. However, for completeness, I’ll go over the other sections that matter. Now, take a look below the two sections we’ve already talked about. You’ll see the section I will refer to as the queue. that might occur, and will help you know if you have been disconnected. the password field, you’ll enter your password. Makes sense, right? you’ve entered this information, click the “Quickconnect” button. Response are scroll by. This may happen very quickly. Don’t worry. see quite a change in the Remote site section. folder as soon as you login that has your domain name (yourname.com). you would just double-click the nameless folder. again, if you aren’t sure contact your host). empty and you are finished uploading. You’re done! Now that wasn’t so hard, was it?